The Lester soil was first proposed in 1939, in McLeod County - near Lester Prairie, Minnesota. The soil was established in 1945, in Dakota County, Minnesota. Lester developed in the prairie/forest interface and is currently mapped in 16 Minnesota Counties. Lester soils are well drained and formed in loamy, calcareous glacial till on ground moraines. 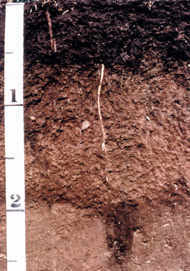 They have a dark grayish brown loam surface with an elluvial horizon and an argillic horizon with clay loam and loam subsoils. Lester soils have properties developed from both grassland and forest environments and are primarily used for forage, corn and soybean production. In 1985, the Minnesota Association of Professional Soil Scientists (MAPSS), formed a committee to designate a state soil. The members voted to designate Lester as their state soil in 1987. In 2012, a significant legislative effort was undertaken to establish Lester as the "Official Minnesota State Soil". The culmination of this effort was the signing of the legislation establishing Lester as the "Official Minnesota State Soil" by Minnesota Governor Mark Dayton on April 28th, 2012. Named after the town of Lester Prairie, Lester is a nutrient-rich soil ideal for the growing of pasture grasses and crops such as soybeans and corn. 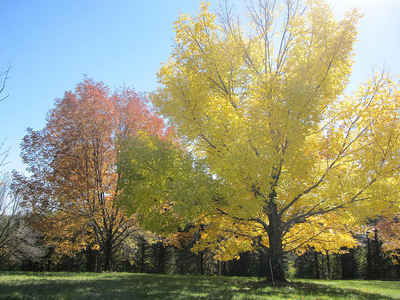 It is present in approximately sixteen Minnesota counties and covers over 400,000 acres. Lester was chosen by the Minnesota Association of Professional Soil Scientists for fitting four criteria: it is based in Minnesota, is extensively located and economically important, and is photogenic. Minnesota is the 22nd state to have an official soil. Lester soils are in 17 different counties in south-central Minnesota. They are of moderate extent and total over 600,000 acres. 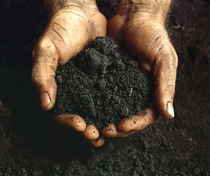 These soils formed under woody vegetation that has been removed in most areas for agricultural production. The principal crops are corn and soybeans. These soils are very productive and of significant importance to the economy in Minnesota. The Lester soils are well drained and formed in loamy, calcareous glacial till on ground moraines. The mean annual precipitation is about 28 inches, and the mean annual soil temperature is about 49 degrees F.
The Lester series consists of very deep, well drained soils that formed in calcareous, loamy till. These soils are convex slopes on moraines and till plains. Slope ranges from 5 to 70 percent. Mean annual precipitation is about 735 millimeters. Mean annual air temperature is about 8 degrees C.
SERIES ESTABLISHED: Dakota County, Minnesota, l945. Lester is designated as the official soil of the state of Minnesota.